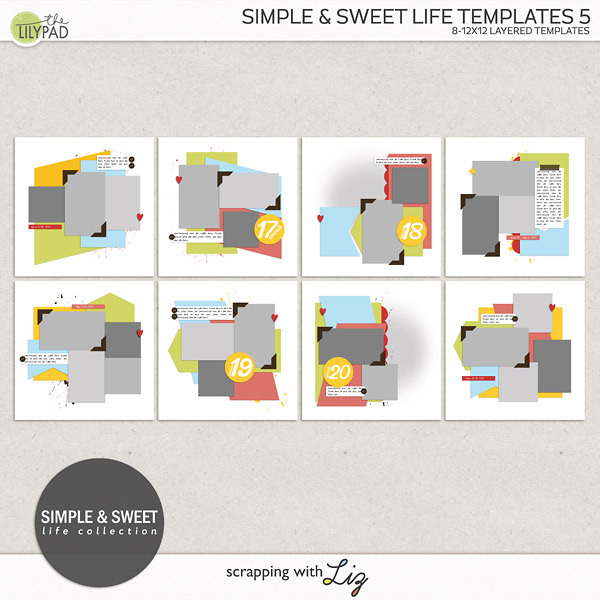 Scrapping with Liz: Sneak Peek & 50% OFF 2 Template Sets TODAY ONLY! 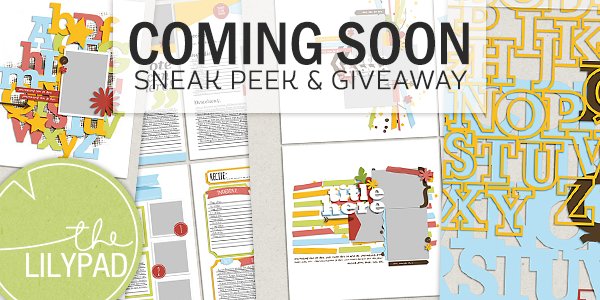 As usual I have my Sneak Peek and Giveaway goin' on on the blog today, but I also have something NEW! This is my first time participating in The Lilypad's weekly Something Old, Something New promotion. This is a weekly sale (every Wednesday) with 50% off select products. I might pick an older product or something brand new, and it is 50% off for ONE DAY only. Today I have chosen two older packs that are a little bigger than most of my sets, so they are a great way for new customers to try out more of my designs. And if you are a long-time customer, you might see something that you missed the first time around. 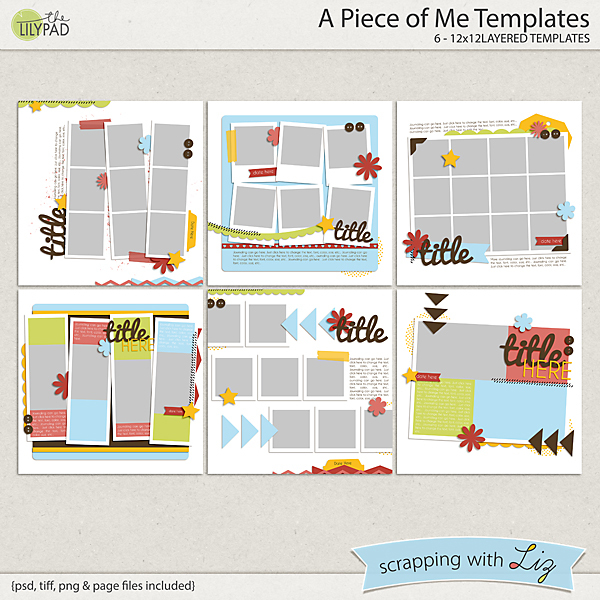 A Piece of Me Templates is a fun set of multi-photo designs. 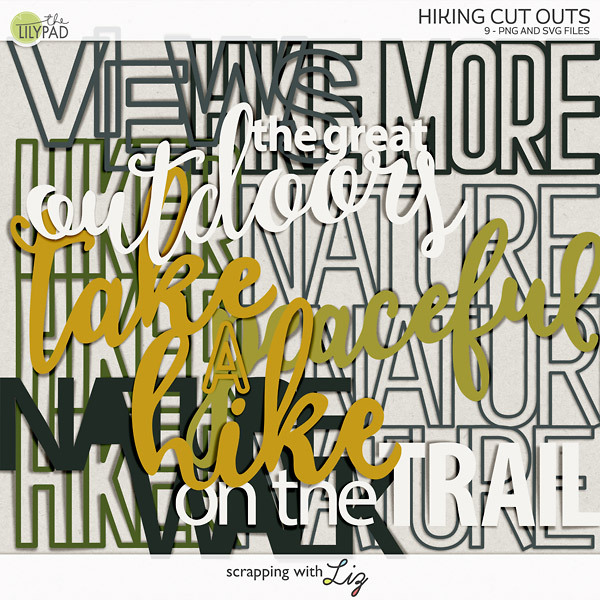 These have a playful photography vibe with lots of photo strips and some polaroid style spots. This set of templates was in a past Digi Files, so check your stash before you buy. My Recyclables line is where I collect past freebies and challenge prizes and make them available to everyone. They usually have a lot of variety, so they are a great way to sample my work. 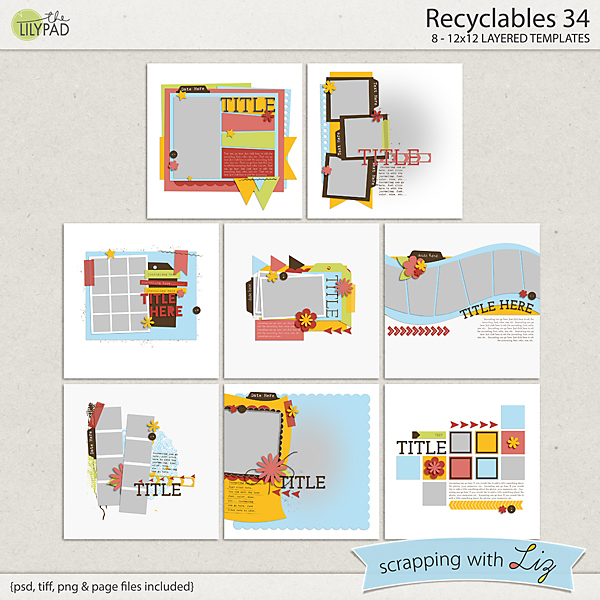 Recyclables 34 has a lot of the features you will find in my templates like faded masks, wavy shapes, and text paths. Grab these today, while they are 50% off! Now, back to my sneak peek. That sneak you see above is a little peek of what I'll be releasing on Friday. And guess what? There's a big sale coming up starting on Friday. You'll be able to grab everything at 30% OFF! Enter the giveaway below and you could win all FIVE of my new releases! Now, go grab those sets at 50% off while you can (if you don't already have them) and come back Friday to check out the new releases. Love the look of the sneak peek with the alphabet! Thanks for the opportunity! Loving the alpha template! Thank you for the chance! Thanks for the opportunity to win your new releases! Ohh that sneak peek looks amazing, love love love your templates and I'm so happy to see you at the Pad :D Thanks for a chance!!!! LOVE the ABC's! We are working on an ABC book. Thank you for the opportunity! And thank you for sharing your talent! I would love to see the Journal That Templates on a SOSN sale. I would love to see the Alphabet Journal Cards on an SOSN sale. Your sneak peek looks amazing! I'm really excited to see more. Those alphabets look so fun! Can't wait to see the whole thing. They look so fun, as always!! Would LOVE to see the My Pregnancy Templates on an SOSN sale. I love all your Templates!!! They are so versatile!! I'd love to see some multi photo templates on sale! I'd love to see calendar templates in the SOSN! I'd love to see your Artsy Journal templates on sale for SOSN. Thanks for the chance to win! Love what I can see in that peek! Thanks for the chance. Love your templates!!! Would love to see one of your album kits in here! Thanks for the chance to win! Thanks for the chance to win some of your beautiful templates!